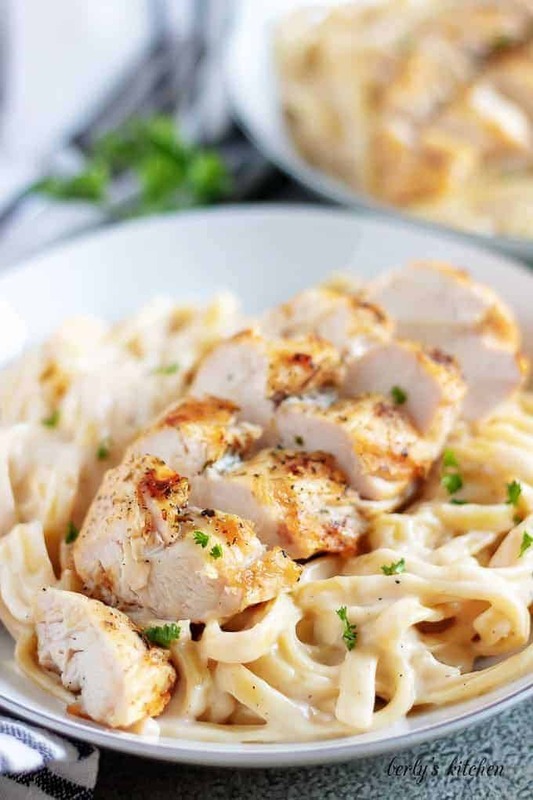 A simple homemade chicken alfredo recipe in just seven easy steps! Tender grilled chicken atop a bed of fettuccine pasta, covered in cheesy Alfredo sauce. 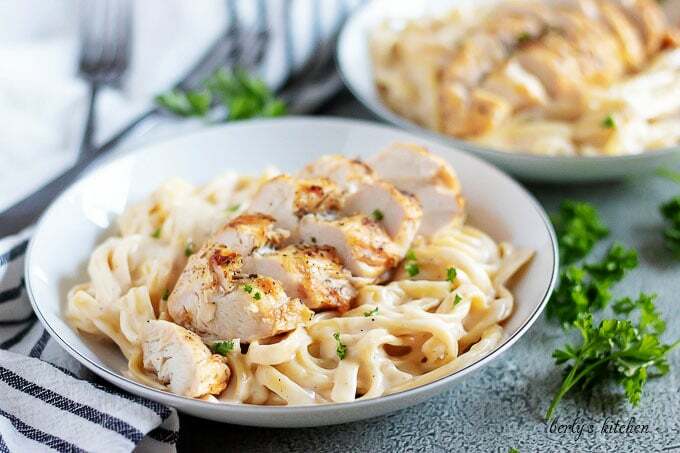 This homemade chicken alfredo recipe has always been one of our favorite pasta dishes. In fact, I’ve been making it for over 15 years. It was one the first meals I ever made for Kim when we were we were dating. Honestly, I think she fell in love with my cooking before she fell in love with me. With Valentine’s Day on the horizon, I figured now would be a good time to share this dish. What’s more romantic than pasta? 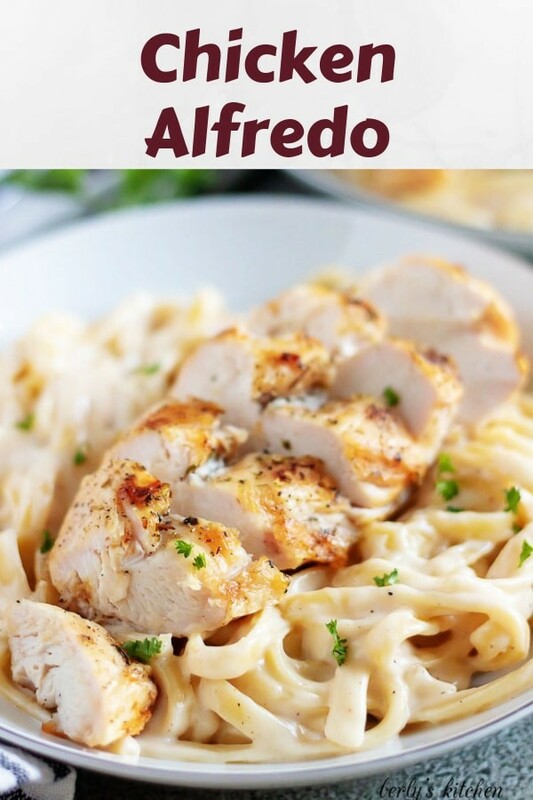 Before I get into the details, I want to say, this alfredo recipe is not authentic. The pasta sauce is an infusion of French and Italian cooking. The base of the sauce is a bechamel, complete with ground nutmeg. I could be mistaken, but I’m pretty sure bechamel sauces are French. In spite of the lack of authenticity, I can ensure you, this recipe is still a must try. The chicken is seasoned wonderfully, and the sauce is rich and loaded with Parmesan flavor. If you’re looking to start making more homemade dishes, then I invite to start with this or our Greek pasta salad. Believe it or not, it’s quite easy to prepare and if you make a mistake, the meal is still edible. What I’ve found, is that most Americans don’t even realize they’re eating a broken sauce. So, if you mess it up, I doubt anyone will notice. Besides, there are very few individuals in this world that are, “born naturals,” at anything. Mastery takes time, effort, and most importantly, practice. Speaking of practice, how about we get started? Let’s start with the prep work, the chicken, and the pasta. 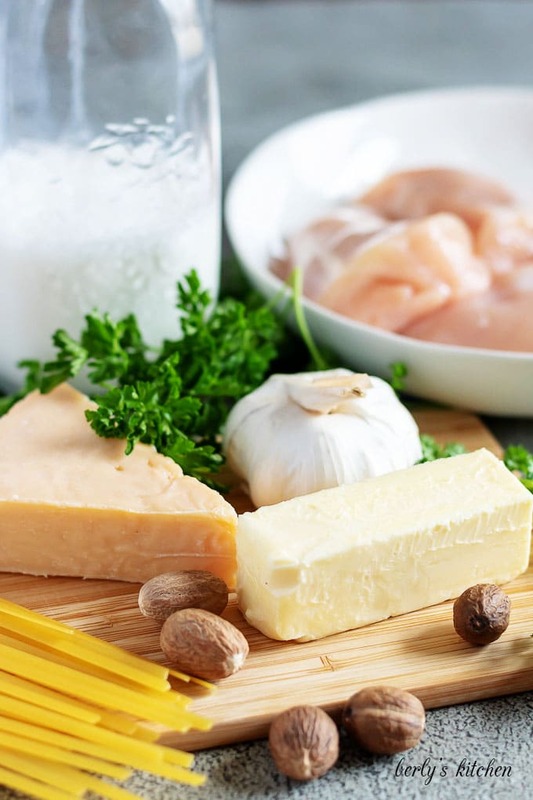 Begin by grating your Parmesan cheese, measuring out your ingredients, and getting a big pot of salted water (1-2 tablespoons of sea salt) boiling. Once you’ve completed that, we can grill the chicken breast. Make sure to evenly season both sides of the breasts with Italian seasonings. Personally, I would add a pinch of salt to each side, but I leave that up to you. Preheat your griddle or pan and then cook the chicken for 10-15 minutes on each side. The amount of time will vary based on the thickness of the breasts. When they’re done, remove them from the heat and cover them while they rest. After that, dump the dry fettuccine noodles into the boiling water. Let them soak for about 7-10 minutes. At that point, you can start checking to see when they are al dente (or almost done). The noodle should be limp, but not completely cooked. Meaning, when you bite into it, the noodle should be soft but not mushy. At the al dente stage, remove the fettuccine from the heat, drain it, and rinse it in cold water to stop the cooking process. Put the pasta back into the pot and then add enough warm (not hot!) tap water to cover it about an inch of water. This action will keep it from becoming sticky and dry while you make the sauce. It’s time to start the sauce. Using a large saucepan, over medium-low heat, melt the unsalted butter. Then, add the all-purpose flour and use a whisk to combine the two ingredients. 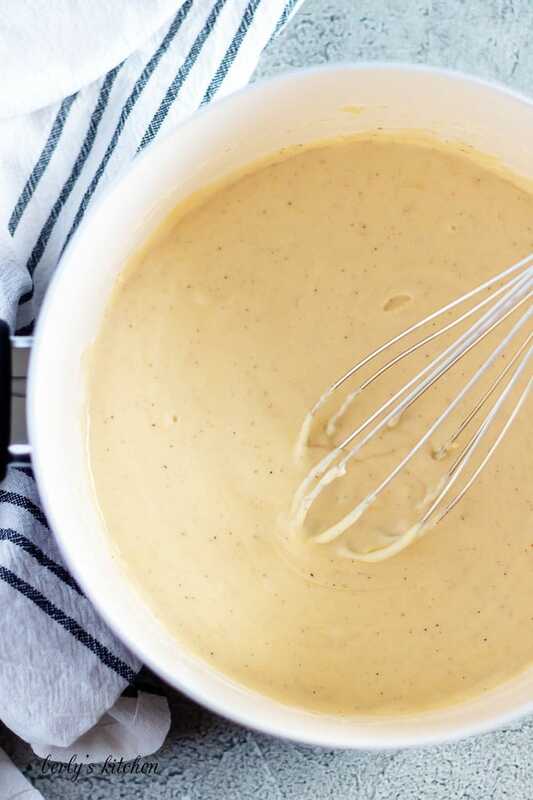 Allow the roux mixture to cook for 4-6 minutes. I wouldn’t let it go much longer, because the longer a roux cooks, the less it thickens the final product. For example, a gumbo recipe has you cooking the roux for a long time. While it does create a delicious flavor and a gorgeous color, the liquid is not as thick as a result. Now that you have your blond roux, you can add the garlic and give it a quick stir. Don’t over cook the garlic or it will become bitter! Shoot for 60-90 seconds at most. Go ahead and add your half and half, and reduce the heat to low. This is one of the most important stages; especially, if you don’t want your sauce to break. Keeping the heat on low and stirring occasionally, let the sauce heat up until it starts to steam. You should see little tendrils (arms) of steam coming off the surface of the liquid. When that happens, immediately start adding the Parmesan cheese. Only put in a handful of cheese at a time. The cheese will lower the temperature of the Alfredo sauce. Which, in turn, makes it harder to melt. Just do a little at a time, keep stirring, wait for it melt, then add more cheese. Otherwise, you’ll end up with big ball of cheese stuck to your whisk or it will sink to the bottom and burn. Hang in there, you’re almost done! When you’ve melted all of the Parmesan into the sauce, remove the pan from the heat. Drain your pasta again and slice up your chicken breasts. You have two options for plating. Toss the pasta and sauce together then top it with chicken and a garnish. Or, you can plate the pasta, chicken, then add the sauce and garnish. Additionally, you could just toss everything together and serve it family style. That’s it, you’re homemade chicken Alfredo recipe is finished. Oh no, the sauce is too thick, it’s like glue! Don’t panic, it happens. Humidity, temperature, etc. all affect how a dish can turn out. Remember that inch of water that’s covering your pasta. Well, you can use that (1/4 cup at a time) to thin your sauce. Just keep adding warm water to the sauce, until it reaches a consistency you enjoy. Keep in mind, you might need to add a little salt and pepper to make up for the extra liquid. 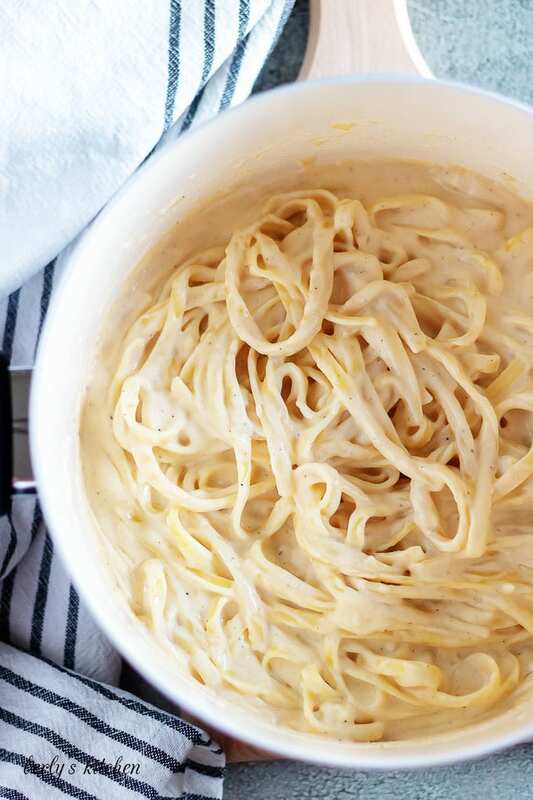 What goes with fettuccine alfredo? That’s a good question and the answer depends on your preferences. With that being said, it’s a pasta that’s incredibly rich and heavy in dairy. For me, I would enjoy a light salad, preferably with a vinaigrette dressing. Something like our shaved Brussels sprout salad would make a nice balance for all that fat. To cut down the total cook time, you could pound out the chicken until it’s about 1/2-inch thick, or get shaved Parmesan cheese. Another option would be to buy a high-quality pasta noodle that only takes a minute or two (2) in boiling water. Those suggestions alone will save you 15-20 minutes in the kitchen. Looking for more pasta recipes? Then take a look at some of our other pasta dishes! 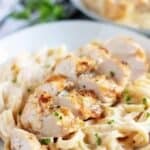 If you like this Homemade Chicken Alfredo recipe, please leave us a comment and rate the recipe card. You can also find us on Facebook, Pinterest, Twitter and Instagram searching for Berly’s Kitchen! Preheat a saute pan or griddle over medium heat and sprinkle the Italian seasonings on both sides of the chicken (optional: add a pinch of salt to each side as well). 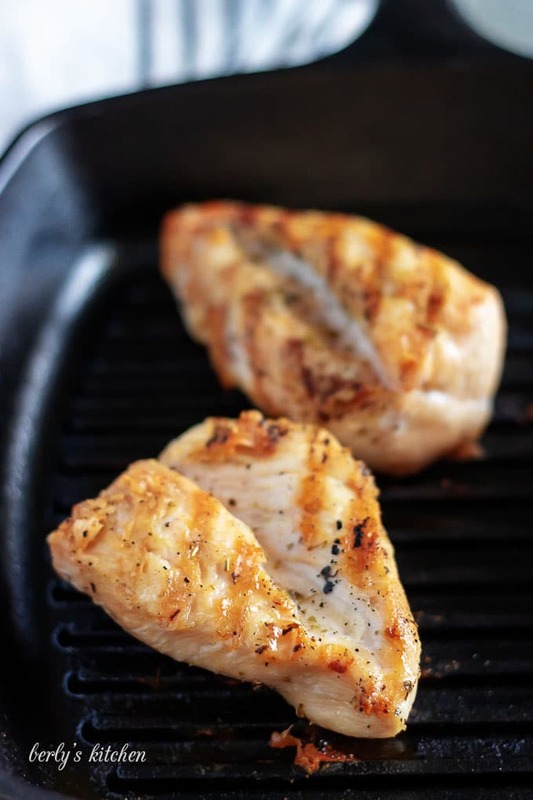 On the hot griddle, grill your chicken 10-15 minutes on each side (depending on thickness). Once done, remove from heat and cover while they rest. After that, cook the pasta in salted water until it is al dente (almost done). Drain it and rinse the noodles under cold water. Cover it in about an inch of warm tap water and set it aside. In a large saucepan or stock pot over medium-low heat, melt the butter and then stir in the flour. Let the mixture cook for 4-6 minutes (blond roux), add the garlic. Stir everything again and let it cook for another 60-90 seconds. Now, pour in the half and half and increase the heat to medium. Toss in the nutmeg and pepper and give it a quick stir. Let it cook until the liquid starts to steam. (Cook time varies 10-20 minutes depending on gas vs. electric stove top.) Once it steams, reduce the heat to low and stir in the grated Parmesan. Add a handful at a time, constantly stirring until the cheese is melted. When the cheese is gone, do a taste test and add salt if needed. Remove the sauce from the heat and drain your pasta. Toss the noodles with the sauce, plate, and top with chicken and garnish. 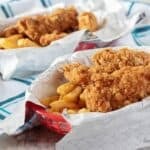 The calories listed are an approximation based on the ingredients and a serving size of four (4) ounces of chicken, two (2) ounces of pasta, and about four (4) ounces of Alfredo sauce. Actual calories will vary. The chicken Alfredo can be stored in your fridge, in a sealed container, for up to three (3) days. When it comes to reheating this recipe, I recommend using your stove-top and not a microwave (microwave heating can break the sauce).